Most of us still rely on CD/DVD writing software applications for file backup, data transfer and distribution, and for ripping audio and video content among other things. 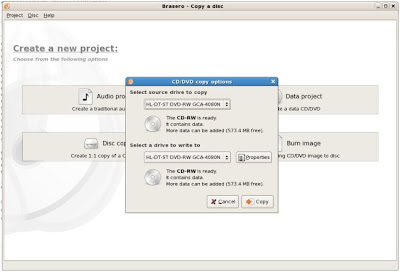 Brasero is the default CD/DVD disc-burning program for the GNOME Desktop. It has a simple GUI and is very easy to use. 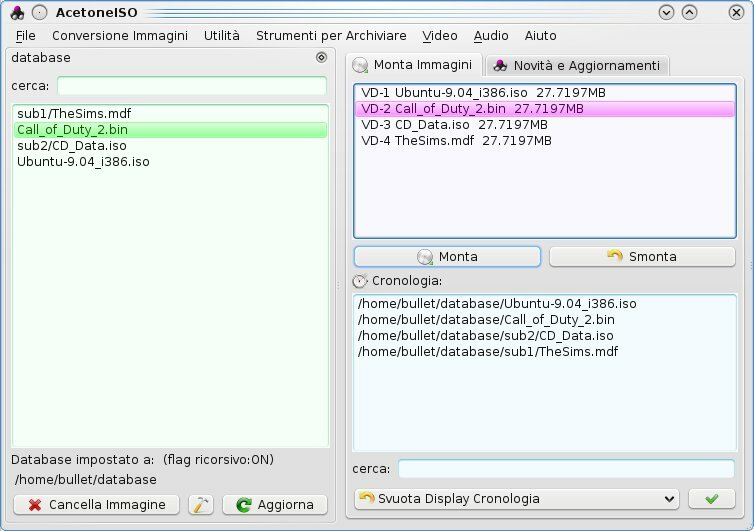 The application supports drag and drop as well as cut and paste from the Nautilus file manager. * supports multiple backends: cdrtools, growisofs and libburn(optional). 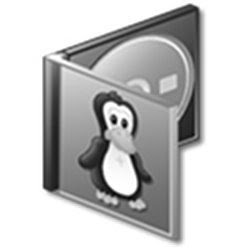 K3b (KDE Burn Baby Burn) is a full-featured CD/DVD authoring software for the KDE desktop environment. It has a graphical user interface for most of its CD/DVD burning tasks like creating an Audio CD from a set of audio files or copying a CD/DVD, as well as more advanced tasks such as burning eMoviX CD/DVDs. 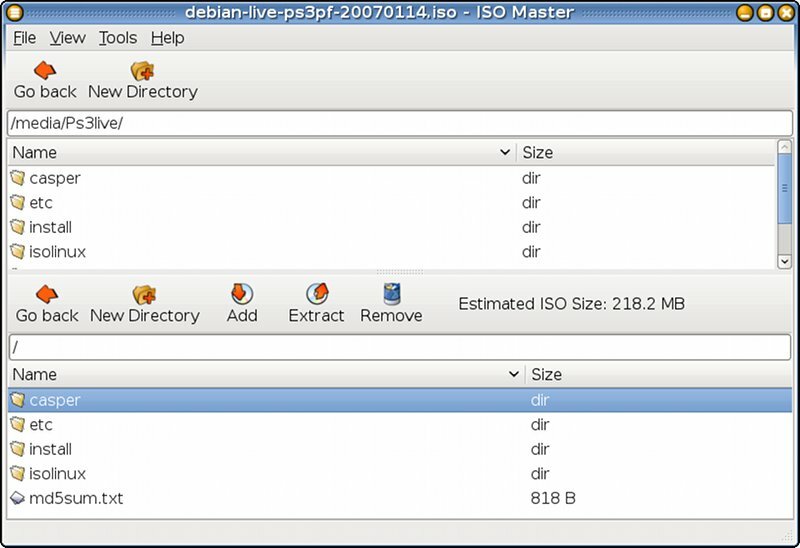 The actual disc recording in K3b is done by the command line utilities cdrecord or cdrkit, cdrdao, and growisofs. The program has many default settings which can be customized by more experienced users. 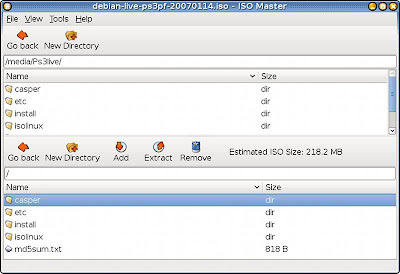 ISO Master is a program that specializes in creating and modifying ISO files (ISO images). It can read .ISO files (ISO9660, Joliet, RockRidge, and El Torito), most .NRG (Nero) files, and some single-track .MDF files. 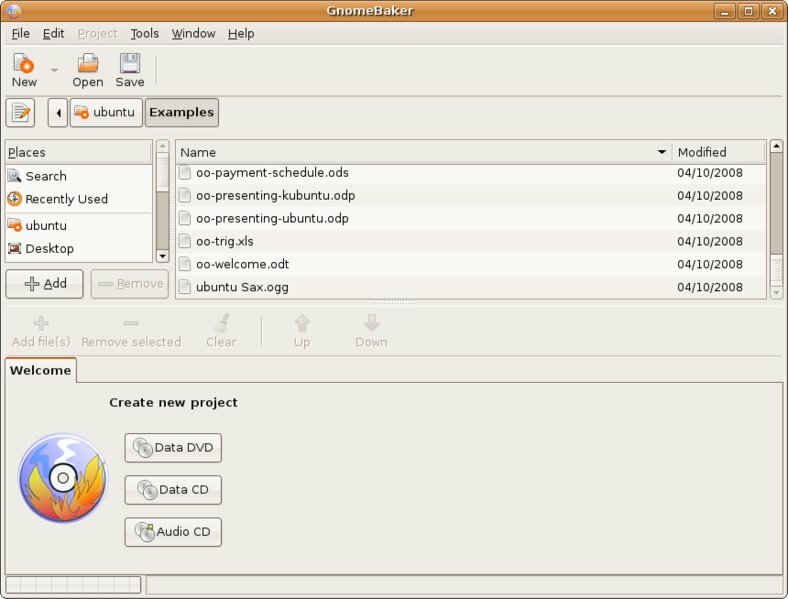 GnomeBaker is another GNOME-based CD/DVD authoring application that offers many features for authoring CDs that surpass the basic Nautilus CD/DVD burning capabilities. * Record to and burn from existing CD ISO images. * Can burn via SCSI and ATAPI on Linux kernels 2.4 and 2.6. Basically if cdrecord works, then GnomeBaker will work. * Drag and drop to create data CDs (including drag and drop to/from the Nautilus file manager). * Create audio CDs from existing WAV, MP3, FLAC, and Ogg files. * Integrate with GConf for storage of application settings. AcetoneISO is a program that is specifically made for mounting and managing image files, but it can do a lot of other things as well. It has a goal of being simple, intuitive and stable. Written in Qt 4, this software is meant for all those people looking for a sort of Daemon Tools for Linux. * Mount automatically ISO, BIN, MDF, and NRG without the need to insert admin password. Only single-track images are supported for the moment. If you know of other free and open source CD/DVD writing software applications, please share them with us via comment. I do not disagree with the comments in this article but the fact remains that media burning is still somewhat of an art. I have Brasero, K3b and Gnome Baker. I have the built-in burner that came with my Dell desktop and an external "LG" branded burner. I use only branded media like Verbatim and Memorex. I burn at slow speeds. Despite all this, half or more of my burns cannot pass an integrity check! This can cause minor problems in an audio/video cd, but it simply won't work for a livecd opeating system. I have resorted to copying OS images to USB flash drives which works in most but not all cases. So, while these apps might be the best at this time, they are still not good enough. I hope a real winner will emerge in the coming months. I'm tired of burning coasters. Hi, and thank you for your post. I'll try ISOMaster, which I didn't know. However, I miss comments about stability of these applications in your article. hum... maybe talking about the RAID based cd burning software would be appreciated too... storing data on *one* CD in *not* a long term solution. To te first comment by anonymous, integrity check failure or not I have never had a bad burn with K3b. I turn off the integrity check as it is unreliable. I always check the md5sum for an ISO burn as verification. That does not mean it should not be fixed, but says nothing about the reliability of the burn. I prefer simple lightweight burners. Generally I use Graveman or MyBashBurn. Also, I think XFCE's default burner, xfburn, deserves a mention. As usual, when I read your post, I notice you forget Xfce-based software... What about Xfburn ? The md5sum output of these two commands should match. Then file "myfile.iso" burnt to a CD-ROM can be read back from the /dev/cdrom device. The article listed explains directly how to NOT BURN COASTERS. I hope this information helps out to not burn coasters and then check/verify a CD-R after burning. Here in post 15 at the end of the discussion, you can read my testing results using "rawread" command to verify that a .ISO file BURNED to a CD-R was perfect. What rawread outputs when there is an error in the CD-R from the file burning process. I didn't know about Acetone. It's too bad none of the others support encrypted DVDs or CDs. So far I've always had to use a script for that, but a drag'n'drop appoach would be nice. "Despite all this, over half of my burns cannot pass an integrity check" and who says of burning software that "they are still not good enough". Please note, I have used k3b successfully for the past 4 years, and have maybe once had a bad burn. (But it could have been a bad image I downloaded.) I burn at stupidly high speeds sometimes (2 gb burn in only 3 minutes or so), and rarely do I burn at slowest speed. And I have no problems. I really expect your burning hardware is shot. Brasero never worked for me. Integrity checks never worked and often it would completely screw up audio CDs. The latest version's interface is damn annoying with the lack of the usage bar. Gnome-Baker is great but in Karmic it is a bit buggy. It no longer seems to detect that my drive has BurnFree, yet that is available in Brasero and XFBurn. XFBurn - very promising but for two annoyances. Firstly, the interface doesn't seem to give me access to my Thunar shortcuts (even GnomeBaker gets that right). More of a problem is the fact that it seems unable to determined how much space is left when you add files. If they sort those out I will switch completely.